Often overlooked, our skin plays a crucial role in defending us from external elements of the outside world. More and more people are turning to CBD Oil for skin care treatment and health. The most massive organ of the body, our skin helps to protect our organs, regulate body temperature, absorb nutrients and keep out harmful toxins. CBD Oil contains natural vitamins and minerals that can benefit your skin’s health. Read more below to find out how CBD Oil for skin works with your body to relieve skin irritations. To manufacture Hemp Extract Oil at Nature’s Script, we extract CBD from high-quality Industrial Hemp. Using an eco-friendly CO2 extraction process, we derive CBD isolate from organic Industrial Hemp plants. The extraction process allows us to remove any unwanted chemical compounds, as well as any traces of THC. The remaining mixture is pure CBD Oil. How Does CBD Oil for Skin Work? 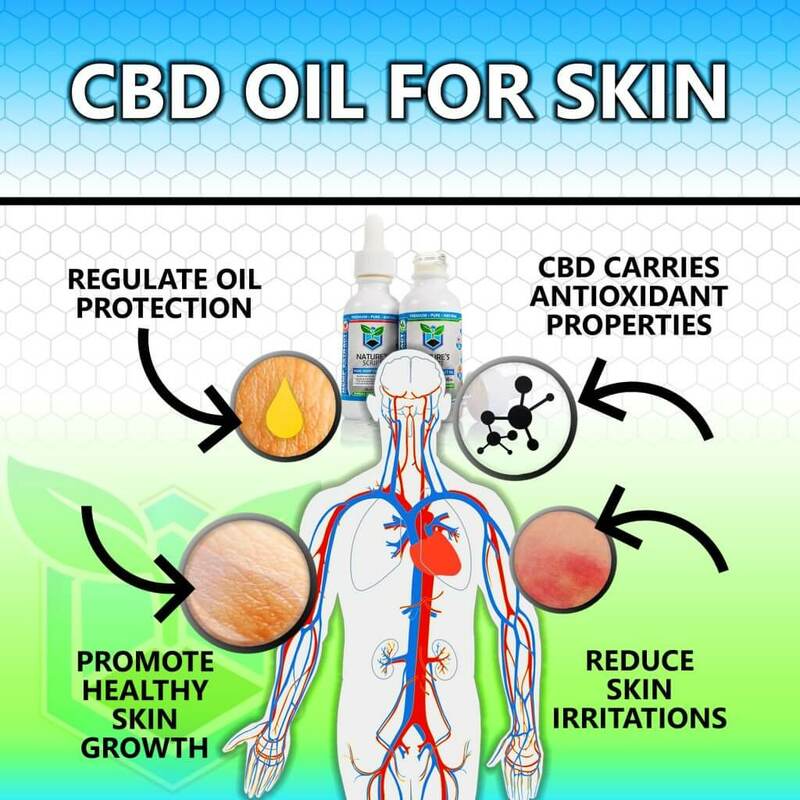 CBD Oil can be an effective treatment for skin health due to the Endocannabinoid System. The Endocannabinoid System, or ECS, is a biological system found within all humans responsible for regulating homeostasis. The ECS is comprised of endocannabinoids that activate cannabinoid receptors (CB1 and CB2) located throughout our peripheral and central nervous system. Introducing Cannabidiol into your system activates your CB1 and CB2 receptors, which can help assist your skin in several ways. CB2 receptors are found on white blood cells and support immune system skin health as well as protect essential cells from oxidation. CBD Oil for skin primarily works in unison with your CB2 receptors to normalize your skin’s oil and inflammation levels. According to a journal article published by the National Center for Biotechnology Information, the ECS is responsible for controlling the growth, immune competence and survival of skin cells. When your ECS is not able to produce enough cannabinoids, you become susceptible to skin inflammation, irritations and diseases. Most importantly, the ECS is at the forefront of protecting your skin from all external factors. Using CBD Oil can increase the levels of cannabinoids in your body, helping to relieve skin-related difficulties. Hemp Oil is effective and safe for most skin types. Containing natural anti-inflammatory properties, CBD helps support the skin’s natural healing process. Cannabidiol can assist in reducing pain caused by skin inflammation, shorten breakouts, and balance dry and oily skin. Above all, CBD Oil for skin is a natural and beneficial way for you to attain your skin's needs. Even if you don't have dry or irritated skin, Hemp Extract can promote a healthier and more nourished state for skin's overall wellness.